This delicious sweet dish uses only two ingredients! For many Russians, the cooler days of early fall are the perfect time to gather in apples from their country homes and prepare jams and preserves for the winter. In mid-August, Russians celebrate the Savior of the Apple Feast Day (Yablochny Spas), a kind of harvest festival. Traditionally, this was the time when people began gathering in fruits and vegetables in anticipation of cooler weather. On the feast day, people bring baskets of apples to church for a blessing. Then, on the first Sunday after the feast day, they throw a tea party featuring food and drink made from apples. The table is laid in the garden and guests are treated to apples, honey and jam, and drink tea from a samovar. They sing merry songs and the party goes on until nightfall. It is believed that the more generously a person treats everyone on that day, the kinder God will be to his or her departed relatives. The Savior of the Apple Feast Day is also the time to begin preserving food for the winter: fruits are used for various preserves and jams, apples and pears are dried and apples are also pickled. 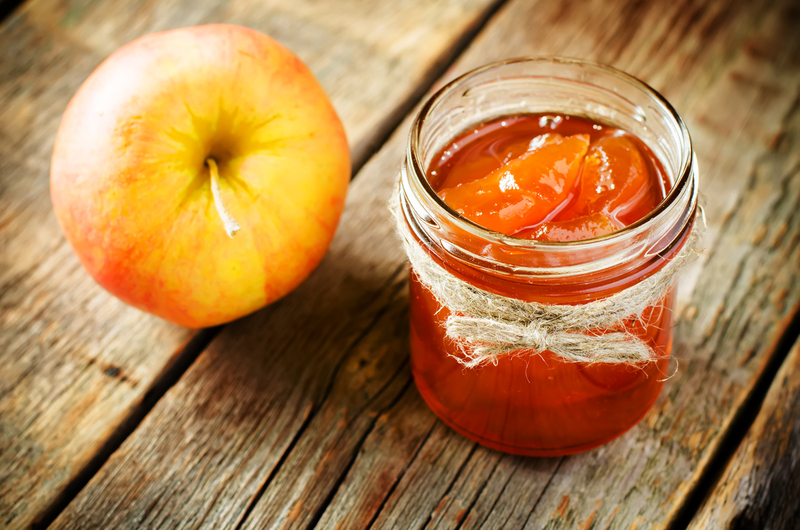 Try this recipe for apple jam, which is so tasty that it is unlikely to last until the winter! This recipe can be modified, but keep in mind that you should always use half as much sugar as you have apples. Also note that the jam cooks down substantially, so you should use at least 500 g of apples. 1. Wash, peel, core and cut the apples into small pieces. You can also grate the fruit using a medium grater. 2. Put the apples into a wide, shallow pan (stainless steel or or enamel cookware is best). Pour sugar evenly over the apples. 3. Cook over low heat 30 minutes or until soft. Then stir and simmer over very low heat for 20-30 minutes. If the jam starts to caramelize, add some water. 4. When the volume has decreased to half the original amount, check to see if it is done. To test it, put a drop of jam on a saucer and let it cool. If it does not drip, the jam is ready. The jam should have a dark amber color. Apple jam can be eaten both warm and cold, as a filling for pies, pancakes and pastries, or by itself. Start with sour apples. Some good Russian varieties are Antonovka, Simirenko, Bely Naliv and Shtrifel. Very mature or over-ripe fruit is best for jam. These apples contain a lot of pectin and shrink better in cooking. To change the flavor, add the zest and juice of oranges or lemons to the jam as it cooks. Vanilla, cardamom or cinnamon are also good additions. Jam can also be made in an oven or a slow cooker. Some appliances have automatic modes for cooking jams and preserves.